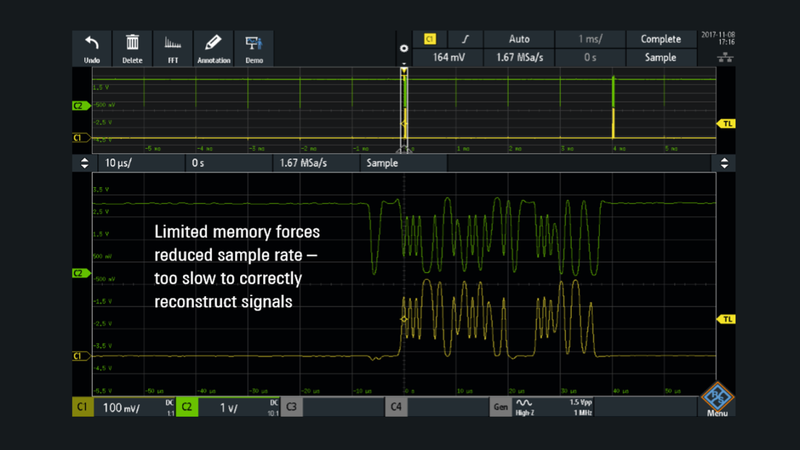 What are the two key benefits of oscilloscopes with deep acquisition memory? Acquisition memory depth equals the number of samples that are stored with each acquisition. Memory depth is specified in points (Mpoint) or samples (Msample). As your oscilloscope acquires more time, more memory will be used to retain the maximum sample rate possible. 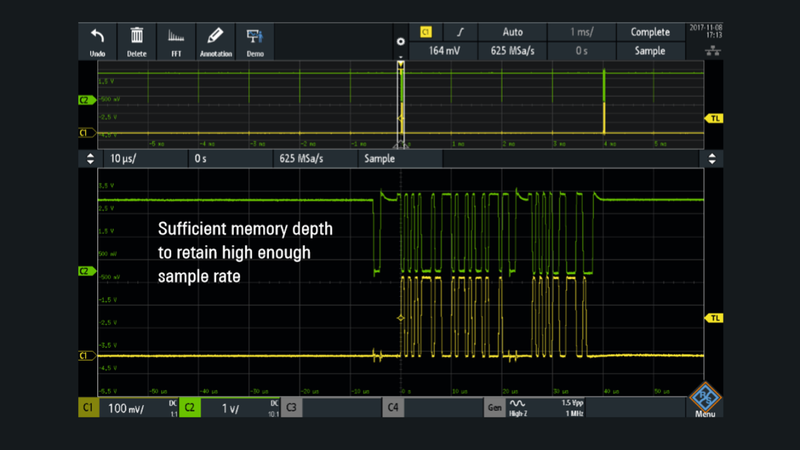 As the amount of time captured increases, your oscilloscope will run out of additional memory. As a result, the oscilloscope begins reducing sample rate. 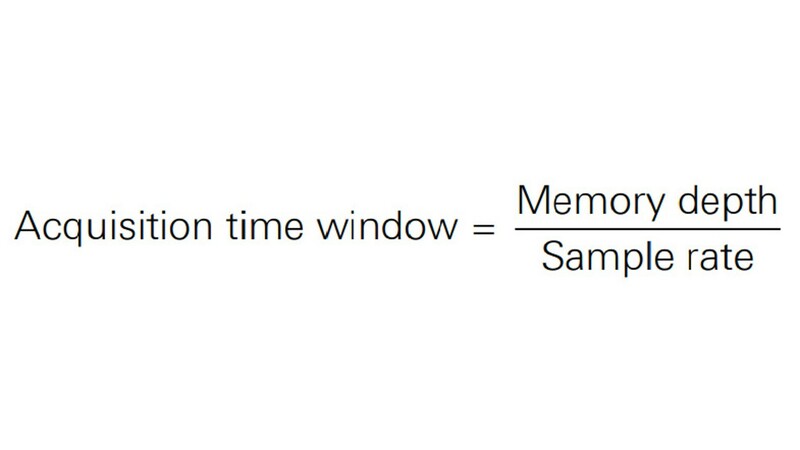 Capturing twice as much time reduces the sample rate by a factor of two. Oscilloscopes are typically designed with a maximum sample rate to match the maximum analog bandwidth needed. When the sample rate is reduced, an undesirable consequence is that the sample rate may not be sufficient to accurately reconstruct the signals. Aliasing may occur. 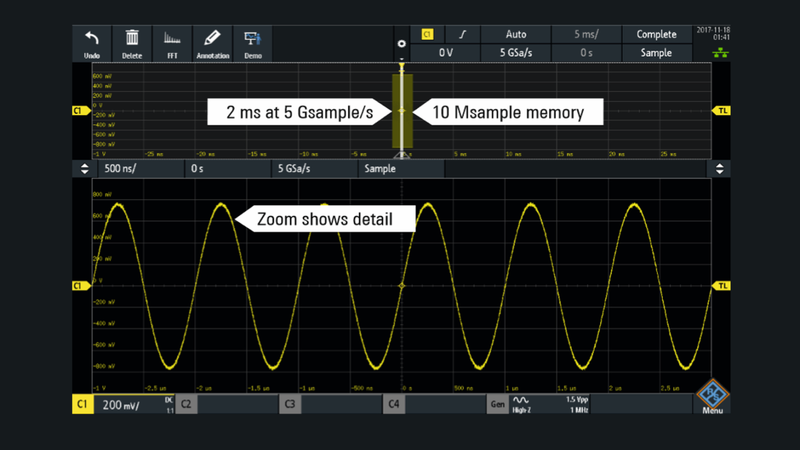 With 10 Msample memory and a sample rate of 5 Gsample/s, the oscilloscope will capture 2 ms of time. 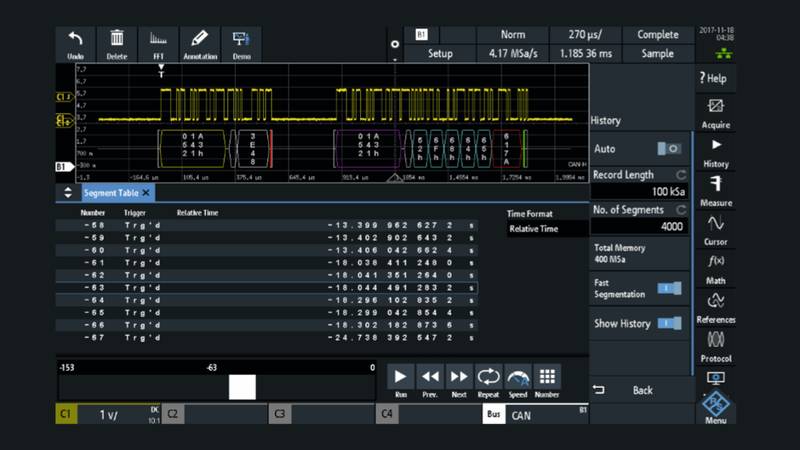 With 200 Msample memory and the same sample rate of 5 Gsample/s, the oscilloscope will capture 40 ms of time. 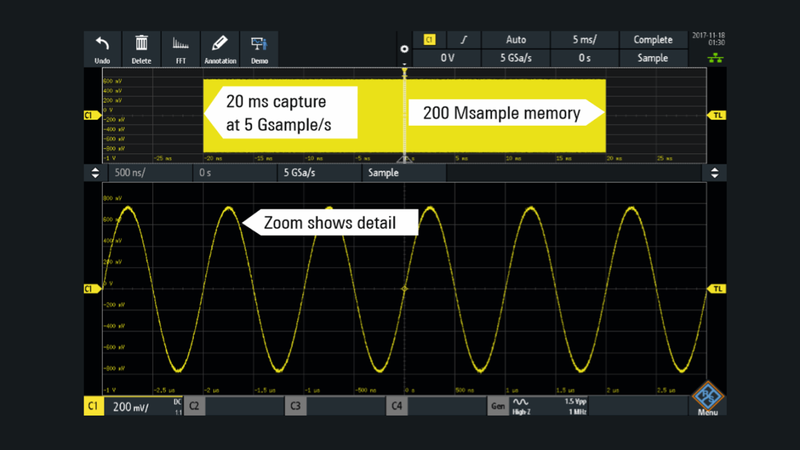 More memory means the oscilloscope can maintain maximum sample rate as the amount of captured time increases. Oscilloscopes with lower memory are forced to reduce sample rates sooner and thus have reduced bandwidths at slower timebases, whereas deeper memory oscilloscopes retain full bandwidth. With sufficient memory, the oscilloscope can retain full sample rate (and rated bandwidth) to accurately show the signal. With insufficient memory, the oscilloscope begins reducing sample rate in order to capture more time. This can lead to insufficient sample rates to accurately show signals. Are there downsides of deep memory? More memory slows down processing and update rate. This reduces the oscilloscope’s responsiveness and increases dead time between acquisitions. 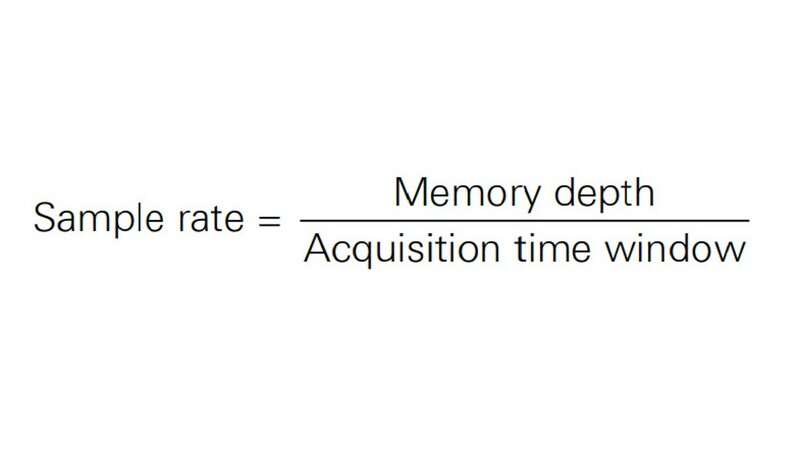 With more deep memory, users can choose to limit how much of this memory should be enabled at any given time. Oscilloscopes often include a mode to partition the memory into smaller segments. For example, the history mode of Rohde & Schwarz oscilloscopes includes segmented memory. The user specifies how many segments the memory should be divided into, with each segment having equal length. When the oscilloscope sees the first trigger event, it stores sample points until the first segment of acquisition memory is full. Then, it re-arms the trigger, which starts looking for the next occurrence of the trigger event. When this trigger event occurs, it stores samples to the next segment of memory. The process repeats until all segments are full. Segmented mode is particularly useful for capturing bursts of activity surrounded by long periods of dead time. Many serial buses and communications signals fit in this category. Using segmented memory, oscilloscopes can maintain fast sample rates and capture time windows that span seconds, hours or days. Using segmented memory, the R&S®RTA4004 captures several CAN bus bursts over 87 s.
How does deep memory enhance segmented memory? With additional memory, users can capture an incremental number of segments at a specific depth. They can also increase the memory depth of each segment, making it possible to see more signal activity around each trigger point. 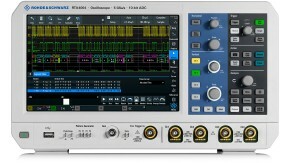 The R&S®RTA4000 oscilloscopes support max. 87 380 segments and max. 1 Gsample memory per channel. The R&S®RTM3000 oscilloscopes support max. 34 952 segments and max. 400 Msample memory per channel.